Restored Farmhouse on 400 acres & ATV/Snowmobile trail network. 7 BR, sleeps 15! Centrally located between Copenhagen and Barnes Corners in the heart of Tug Hill, Beaver Creek Lodge is right on the official Lewis County snowmobile and ATV trail network. A restored farmhouse on 400 acres, Beaver Creek Lodge is a year-round rental with seven bedrooms, living room, dining room, full kitchen and two baths, making it ideal for large families, or groups. Rental of Beaver Creek Lodge includes exclusive use of the entire lodge, including hunting privileges (in season). 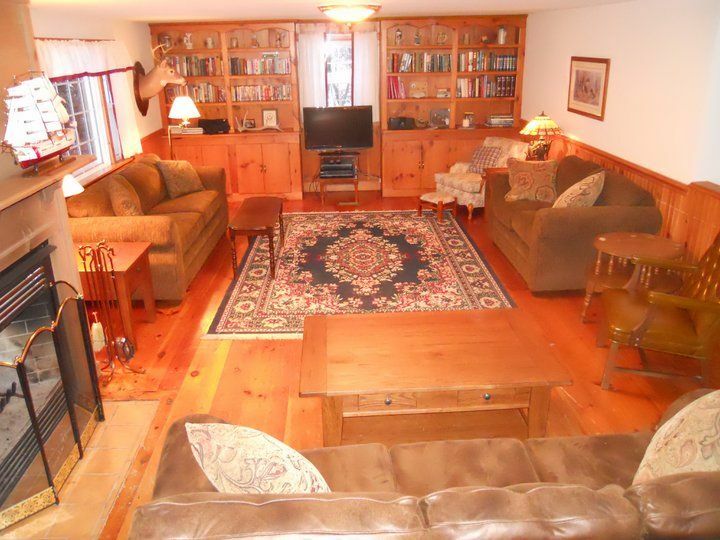 It is a perfect home base for enjoying the many pursuits available around Tug Hill. Beaver Creek Lodge is less than an hour's drive to Alexandria Bay, Clayton, 1000 islands, Sackets Harbor and world class Salmon fishing on the Salmon river. Old Forge is approximately a 1 1/2 hour drive, close enough for a day trip. Lodge Description: The lodge is a restored farmhouse spacious enough for large groups and families. The first floor contains the kitchen, dining room, living room, 2 bedrooms and a full bath. The second floor has 5 additional bedrooms and a second bath. There is also an enclosed porch/mud room for storing your outerwear and as a staging area to prepare for your ride. The living room serves as the main gathering place at Beaver Creek Lodge. It has plenty of seating, a fireplace, HDTV and library. Adjacent to the living room, the dining room hase a large table that seats 8+. It also serves as a gathering place and is perfect for board or card games. Our full kitchen is complete with all the appliances and utensils needed for your stay. It features a full size refrigerator & stove, and also includes a microwave, coffee maker and toaster. The kitchen also has a table for additional seating and a full size washer & dryer (free) should you need them. Property: The lodge has a circular driveway with easy access from the road, providing easy access for vehicles with trailers. We are right on the snowmobile/4-wheel trail network, enabling you to ride right from your door, which obviously makes us popular for snowmobiling and ATVing. Our property is approximately 400 acres, and is adjacent to Granger State Forest and Pickney State Forest. Without having to drive you can hunt on our lands or the state forests, totaling over 6400 acres. Beaver Creek Lodge was created in the late 1980's by Robert Whipple, a consummate farmer and outdoorsman from Knox, NY who loved the beauty of the Tug Hill region. Bob envisioned a place where one could come and enjoy the bounty of nature's offering, while staying in a place with all the comforts of home. Whether you come for hiking, hunting, snowmobiling, 4-wheeling, skiing, fishing, communing with nature or just plain escaping the normal grind, Beaver Creek Lodge offers the perfect home base. Today, that vision is continued by Bob's children, who invite you to come experience Tug Hill and Beaver Creek Lodge. Circular driveway with plenty of parking for vehicles with trailers. Large room with fireplace and HDTV. 2 sofas, 1 loveseat and 2 chairs. Full kitchen with table that seats 6 comfortably. Dining Room table seats 10 comfortably. DVD/Blu-Ray player with small selection of DVDs. Firewood is provided for winter rentals. The Lewis County snowmobile and ATV trail system directly accessable from property. Rental includes unguided hunting priviledges on our 400 acres. Adjacent to over 6000 acres of state forest where hunting is also allowed. The Tug Hill region is directly west of the Adirondacks and just south of the 1000 islands, located roughly in the triangle formed by Watertown, Rome, and Syracuse. It encompasses approximately 2000 square miles. The most outstanding characteristic of the Tug Hill region is its undeveloped state. There are some small, scattered hamlets and villages along the outer edges of the region, but the core area is heavily forested and relatively unpopulated. The area, because of its landform and location east of Lake Ontario, has the perfect conditions for lake effect snowstorms. These storms are responsible for the majority of the 200-300 inches of snow which fall each year, turning the region into a winter wonderland. The heavy snowfall is one of Tug Hill’s greatest recreational assets. Tug Hill has an extensive snowmobile trail network criss-crossing the region. A rapidly growing ATV trail network compliments the snowmobile trails, providing year round riding opportunities. Additional per person per night guest fee is for adults only. Children under 18 are not included in guest count.